Indigo East 604 - Beach Front Unit with Luxurious Interior and Amenities! Experience the ultimate in luxury and comfort by staying in this stunning 2 bedroom, 2 bath Indigo unit with bonus den! The Indigo Resort is the most desirable destination in Perdido Key, situated on a stretch of the Gulf Coast’s most treasured seashores and offers opulence, style and endless amenities. This 6th floor unit features a bonus den, giving you lots of extra space and a bright and open floor plan, with over 1600 square feet of luxury to enjoy! The views from the 6th floor are breathtaking, both north and south, as it is surrounded by the Gulf of Mexico, Old River and the Intracoastal Waterway. The unit is adorned with elegant yet contemporary furnishings, with a large sofa and oversized chair in the living area, which also features a LCD television and beachfront balcony access! 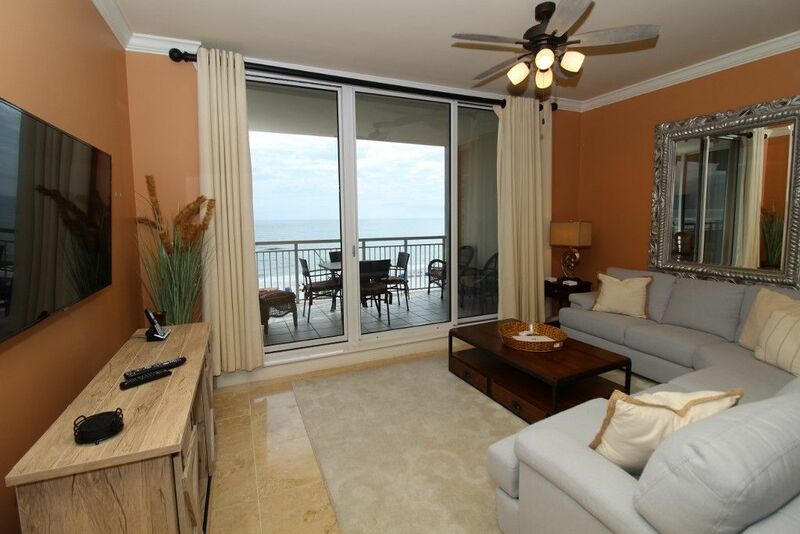 The expansive sliding glass doors afford amazing views, bringing the beach right inside! The oversized gulf front lanai with panoramic views allows you to enjoy the sparking emerald waters and glistening sands of the pristine coast from the comfort of your unit, and with plenty of outdoor seating you can savor your morning coffee, sip your favorite after-dinner cocktail and even dine al fresco while enjoying the serenity of the waves and coastal breeze. The fully equipped gourmet kitchen makes preparing your favorite meal both effortless and enjoyable! With upgraded stainless steel appliances including a side-by-side refrigerator, wall ovens, and a smooth glass cook top, granite countertops, custom wood cabinetry and all the utensils and cookware necessary, you’ll feel like a seasoned chef while cooking in this dream kitchen! The dining area hosts a beautiful glass dining table with seating for 4 and a breakfast bar with additional seating for 2. The master suite is a true sanctuary, boasting a king size sleigh bed with a leather structure, premium mattress and luxury linens, a reading area with a plush chair, beachfront balcony access and a LCD television! The attached glamour bath is endowed with everything you will need to relax and rejuvenate, offering a walk-in glass and travertine shower, double vanities with granite countertops and travertine floors throughout. The second master suite is equally impressive, also hosting a king bed with luxurious bedding, north balcony access with amazing views of Old River and the Intracoastal Waterway, an attached full bath and a new LCD television! The bonus den also features north balcony access and a comfy couch, and there is a sleeper sofa in the living room allowing for accommodations for 6! Indigo features the most luxurious amenities offered at any resort on the Gulf Coast, including gated entry, a 6000 gallon zero entry resort-style pool and gazebo, hot tub, an additional seasonally heated smaller pool, top-quality outdoor grills, lighted tennis courts with a Hydro court surface, steam rooms, saunas, two state of the art fitness rooms, a private 12 person theater, garage parking, and interior elevators that open to your private foyer, which is characteristic of each Indigo unit! You will also have the convenience of an in-unit washer and dryer and conveniently located trash chute right outside your door. Ranked by Condé Nast Traveler as one of the top 5 swimming beaches Perdido Key offers an abundance of recreation and activities, including fantastic restaurants, championship golf courses, water sports and lovely shops and boutiques. The Pensacola Naval Air Station is a short 15 minute drive from Perdido Key, and is a great place to take the family! A 10 minute drive west will take you to Orange Beach, which hosts spectacular restaurants, shopping and recreation as well. Stayed here several times always a good time.Luxury Coastal very easy to work with. Enjoyed staying in this unit. It was nice because it had two king beds in the bedrooms and that was great for us. Only thing I would had liked better was if they had a larger table for eating . Thank you for choosing to be our guest and providing us with your feedback! The owners are always welcoming feedback to help ensure the satisfaction of each and every stay. We are happy to hear you enjoyed your stay in the unit! The rooms have a great amount of space to give a true sense of relaxation. We hope to have you join us again in the near future! Very impressed with the property overall. No issues with check-in or check-out, everything was as advertised. Our suite was in perfect order upon arrival. Enjoyed our stay immensely. Would come back in the future and happily recommend to others looking for a family oriented beach vacation. The condo was beautiful with a great view of the pool and ocean. We enjoyed the complimentary beach service.